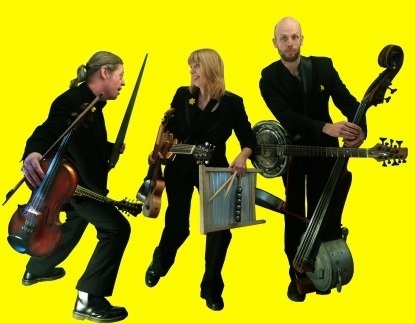 The Churchfitters is a folk band like no other. A double bass made out of a motor bike petrol tank. Heart-wrenching vocals accompanied by a musical saw. Foot-stompingly fast fiddle mixed with infectious funk-rock rhythms and traditional tunes reinvigorated with mesmerising jazz sax! Throw in some exquisite harmonies, a slew of startlingly original songs and a few jokes that create instant rapport and you’ve got a high-energy show that always leaves audiences cheering. How do you adequately describe such a musically diverse, uplifting band? You leave it to Mike Harding, a self-confessed ‘huge, huge fan’. He calls their music ‘totally brilliant and beautiful’.